Football loyalties start early, and traditions bring communities together. The fierce, but friendly, annual high school football competition between the county and city school systems in Oxford, Mississippi, is a good example how sometimes the score—which is posted on the pillars in front of University Sporting Goods on the Square in downtown Oxford—doesn’t tell the whole story, and in some cases both teams even win. Crosstown Classic Rivalry Week highlights the week of the Crosstown Classic, a decades-old clash between the county team, Lafayette High School, and city-based Oxford High School. Several events, including Spirit Night, are hosted by Lance Reed at his Chick-fil-A® restaurant in Oxford, giving fans of each high school a chance to outshine the other. “Basically what happens is they bring us together as a community,” Oxford Co-Cheer Coach Kristin Busby says. Chick-fil-A tracks which team’s supporters spend the most during Crosstown Classic Rivalry Week events, and while the winning team gets bragging rights, money raised by each school’s supporters throughout the week is then donated to each school. So, both schools win. Chick-fil-A also makes an additional donation to a local food charity. While the high school football season is over in Mississippi, the community in Oxford is again coming together to support the other local football team, the Ole Miss Rebels, in the Chick-fil-A Peach Bowl on Wednesday. 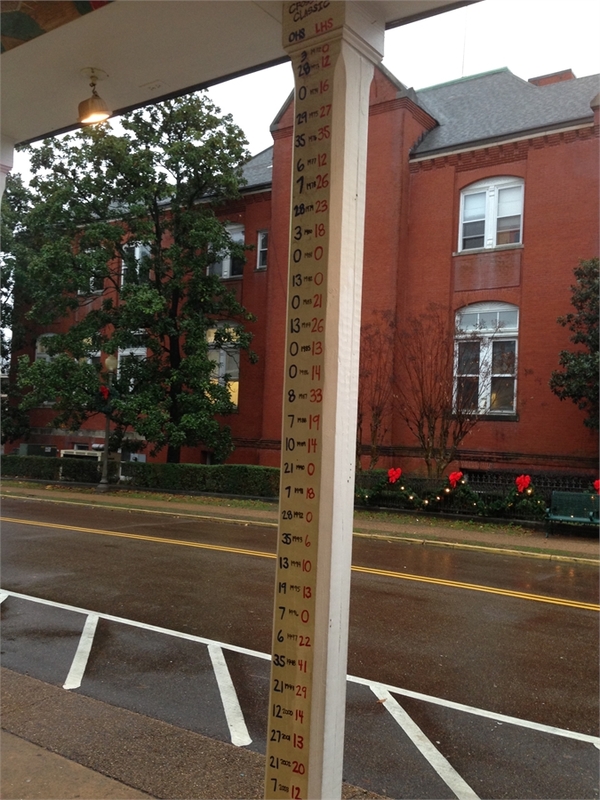 The annual game scores posted on the pillars in front of University Sporting Goods on the Square in Oxford.